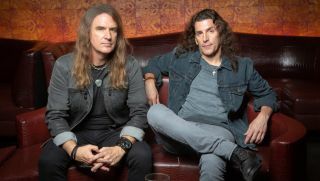 Altitudes & Attitude, a collaboration between Anthrax bassist Frank Bello and Megadeth bassist David Ellefson have shared a new song, “Late.” The track comes off their debut album, Get It Out, scheduled for release January 18 via Megaforce. You can check it out above. The follow-up to Altitudes & Attitude’s 2014 self-titled debut EP, Get It Out was produced by Jay Ruston (Anthrax, Steel Panther, Stone Sour) and features drummer Jeff Friedl (A Perfect Circle, Ashes Divide). Guest musicians include Ace Frehley (on the song "Late"), Gus G, Nita Strauss, Christian Martucci (Stone Sour) and Satchel (Steel Panther). Said Bello about Get It Out: "I've learned that writing songs is very cathartic. A lot of these lyrics are about the inner struggles of my life, and about the rage that has built up from my life experiences—my brother's murder; my father abandoning my family when we were young, leaving us with no funds to pay the bills. The ups and downs of life in general. I've always had an anger inside that music really helps me deal with." Added Ellefson: "The album has the perfect title. This is music that has been living inside of us for so long. There's a big musical part of each of us that doesn't get heard anywhere else."